Hello sunshine, hello flowers, hello strawberries and hello happiness. I can't describe how positive I feel today. Everything seems more beautiful then usual. I'm wearing my casual outfit with my new sandals. God they are so comfortable!! 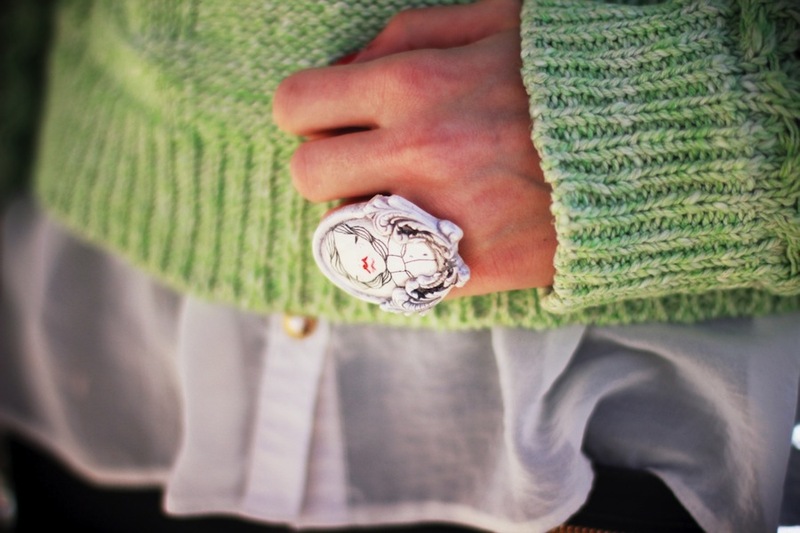 I have my new Micica Studio ring on, it't the cutest ring I own. Check out Micica unique designs, they're all breathtaking. Savršeno ! Sandale, awwhhh ! Gorgeous outfit, I love the sweater and the shoes! oh wow, you rock big time! Kombinacija je super,kao i uvijek...jedino što mi nije jasno je to kada većina blogerica naglašava kako su udobne neke vrtoglavo visoke potpetice...takve štikletine ne mogu bit udobne ni na koji način,mogu jedino bit malo lakše za trpit i podnosit od nekih drugih...ne znam osobno za tebe,ali većina blogerica ni ne obavlja neke napornije poslove u ogromnim peturinama,samo sjede po kavama ili na faksu,a u postovima predstavljaju kao da su pretrčale grad uzduž i poprijeko u tome.Svi mi znamo da realna žena ne živi tako. wow this look is so amazing. you look gorg and that neon sweater is perfect! xO! love these stripes - blue-black! you have such a lovely blog with stunning photographs! i followed straight away its just too lovely! your outfit is very pretty, I love the sweater. And the colors remind me it's supposed to be spring soon! Wonderful Style!!! I love the Shoes so much!!! Such a fabulous look! I LOVE all of these pieces. Those shoes are killer and that jacket is gorgeous. Love the styling here! hej, od kud su štikle? predivna si. What an outfit! Lime and navy are always such a good combination!